Lavel Schwartz, one of the handful of rabbis arrested in the roundup of 44 politicians, rabbis and others in 2009, was sentenced to a year and a day in federal prison for money laundering conspiracy. The far-reaching federal probe included government corruption and a money-laundering scheme. Schwartz admitted meeting with Solomon Dwek and agreeing to launder money through a series of purported charities. Dwek, who was cooperating with the feds, told Schwartz that the money being laundered was from his illegal business. According to the feds, Schwartz and his brother Rabbi Mordchai Fish agreed to launder hundreds of thousands of dollars for a 10 percent fee. Federal Judge Joel Pisano ordered former Toms River school superintendent Michael Ritacco and the district’s former insurance broker Francis Gartland to pay $4.3 million in restitution. Frank D’Alonzo, former supervisor of athletics for the district, was ordered to pay $1.6 million in restitution. According to the feds, D’Alonzo took hundreds of thousands of dollars in bribes from Gartland and passed a portion of the money to Ritacco in exchange for maintaining insurance and other business for Gartland. Gartland and Ritacco were charged with a scheme that gave Ritacco between $1 million and $2 million in bribes to keep Gartland in the insurance business with the school district. Gartland and Ritacco were sentenced to 11 years and three months in federal prison. D’Alonzo was sentenced to three years and two months. In addition to the restitution, Garland was ordered to forfeit $11 million and D’Alonzo ordered to forfeit $4.3 million. Ritacco already forfeited $1 million, a 2012 Mercedes Benz and $8,950 in cash. Federal Judge Joel Pisano, who heard case, has been outraged by the more than $4 million loss to the school district. “It takes the cake,” Pisano said. Even for New Jersey. The director of operations for the North Bergen Housing Authority pleaded guilty to taking bribes in return for fraudulent employee vacation pay. John Kennell admitted extorting cash payments from employees of a company that did repairs and grounds maintenance for the authority. Kennell accepted a total of $2,500 in payments of $100 to $400 from employees for securing additional paid vacation days. The feds said Kennell reported the employees were working when they actually were traveling outside the country. Under the scheme, the authority contractor paid employees for 80 days of vacation totaling $12,498, according to the feds. Assemblyman Robert Schroeder, a Republican from Bergen County, has been indicted on charges that he stole more than $1.8 million from people who loaned him money and wrote more than $3.4 million in bad checks. State Attorney General Jeffrey Chiesa said the investigation resulted from complaints by lenders who trusted Schroeder because of his public position and allegedly lost millions of dollars. “This indictment, which would carry a substantial prison sentenced upon conviction, demonstrates that nobody is above the law,” Chiesa said. Schroeder’s company, All Points International Distributors, sold tents and portable buildings to the U.S. military for Afghanistan and Iraq. When business declined, he borrowed money from individuals, and when he fell behind in repayments, wrote bad checks, according to the indictment. He is charged with writing at least 47 bad checks totaling at least $3.4 million to 12 individuals. He also is charged with persuading people to loan him $1.8 million for a housing project in an oil drilling area of North Dakota and then using the money for other debts. Schroeder, who says he is innocent of the charges, was elected to the Assembly in 2010. Carmine Inteso Jr., former mayor of Toms River Township (formerly Dover Township), pleaded guilty to tax evasion. From 2005 to 2008, the feds charge that Inteso accepted $291,000 from Francis Gartland, an insurance broker who provided brokerage services to Toms River Township and other New Jersey municipalities, and failed to report the money on his income taxes. (Gartland has been sentenced to 11 years in prison on charges including conspiracy to defraud the IRS.) Inteso was arrested at New York’s JFK airport in July 2012 when he returned from Afghanistan. The feds said he took the job as a contractor in Afghanistan after learning he was the target of a tax investigation. Two more men have been sentenced in what federal Judge Joel Pisano called the worst case of public corruption he has ever seen. Joining former Toms River school superintendent Michael Ritacco (who was sentenced to 11 years and three months in prison) are former insurance broker Francis X. Gartland and former supervisor of athletics for Toms River schools, Frank D’Alonzo. Pisano sentenced D’Alonzo to three years and two months in jail after he pleaded guilty to bribery and tax evasion. According to the feds, D’Alonzo took hundreds of thousands of dollars in bribes from Gartland and passed a portion of the money to Ritacco in exchange for maintaining insurance and other business for Gartland. Both Gartland and Ritacco were charged with a scheme that gave Ritacco between $1 million and $2 million in bribes to keep Gartland in the insurance business with the school district. Gartland, like Ritacco, was sentenced to 11 years and 3 months in prison after pleading guilty to mail fraud, conspiracy and perjury for his role in the scheme. A former borough attorney for Bergenfield, Dennis Oury, ended up with three years of probation for his role in a grant-related scheme in which he teamed up with Joseph Ferriero, former Bergen County Democratic chairman. Oury pleaded guilty to conspiring to commit mail fraud and failing to file federal income tax returns. According to the feds, Oury and Ferriero created a grant consulting firm and agreed to conceal their interest in the company while conspiring to obtain and to profit from a grant to Bergenfield. In 2009, Ferriero was tried and convicted of conspiracy to commit honest services mail fraud, but the federal charges against him were dismissed after the U.S. Supreme Court ruled that a “theft of services” law could only be used in cases where there was a bribe or a kickback. Oury, who encouraged Bergenfield to hire the Oury-Ferriero grant firm without disclosing his interest and then profited from the grant, was given a light sentence because he testified against Ferriero during his trial. In addition to probation, Oury was fined $17,500. After less than five hours of deliberation, a jury convicted Hamilton Township Mayor John Bencivengo of extortion, bribery and money laundering. The five-day trial centered on the testimony of cooperating witness Marliese Ljuba, the health insurance broker for the Hamilton Township School District. The jury convicted Bencivengo of taking $12,400 in bribes in exchange for using his official influence to help Ljuba keep her position, instead of putting the health insurance contract out for bid. Conversations recorded secretly by the feds showed that the mayor received the bribe in three payments. Bencivengo, who resigned after the conviction, contended the payments were loans he intended to pay back. The jury didn’t buy it. “With today’s guilty verdict, we add another name to the list of New Jersey public officials who have chosen to sell their influence,” said U.S. Attorney Paul Fishman. A congressional report blames Jon Corzine for the death of MF Global. Before heading to MF Global, Corzine was governor of New Jersey, its U.S. senator and a co-chair of Goldman Sachs. The report tells a chilling story of the loss of money by farmers, ranchers and other customers of MF Global. It says Corzine recklessly bet on the debt of European countries and made the decisions without properly vetting them with MF Global’s board of directors. When the company ran into trouble, it tapped into customer funds, and Corzine has said he does not know how $1.6 billion in customer money disappeared. Corzine is a Democrat, and the report was written by GOP staffers on the House Financial Services oversight subcommittee. A Corzine spokesman denied nearly all the subcommittee’s conclusions and said 80 percent of the customer money has been returned. New Jersey voters approved a constitutional amendment requiring judges to pay more for their health and pension benefits. The amendment was put on the ballot after the state Supreme Court ruled that unlike other New Jersey state workers, judges did not have to pay more for those benefits. The state constitution does not allow other branches of government to reduce judges’ salaries. The judges thought that also meant no hike in the cost of benefits. The voters said otherwise. The former director of the state Division of Taxation and an assistant deputy director, who were found guilty of official misconduct for accepting gifts from a collections company at the same time they were making decisions about the company’s contracts with the state, have been sentenced. The state recommended 364 days in county jail for former director Robert K. Thompson and four years in state prison for David Gavin, former assistant deputy director. Superior Court Judge Andrew Smithson gave them both a year of probation. (Smithson is the same judge who dismissed the whistleblower’s case against the Board of Public Utilities.) The two, suspended without pay since 2006, had to forfeit their jobs and are barred from public employment in New Jersey. The state’s investigation found they accepted dinners, entertainment and golf outings worth thousands of dollars while deciding on contracts for OSI Collections Services Inc. An investigation by the State Commission of Investigation in 2005 found that while managers in the Division of Taxation accepted lavish gifts from OSI, the company inflated its bills to the state by hundreds of thousands of dollars each year. In an agreement with the state attorney general, the company paid $2 million in restitution. Solomon Dwek, who worked undercover for the feds and helped jail corrupt politicians, is going to prison himself. Judge Jose Linares sentenced Dwek to six years in jail after he pleaded guilty to bank fraud and money laundering. Dwek was involved in a scheme to defraud PNC Bank of more than $50 million and to launder $22 million through other banks. “He must stand accountable for his own crimes, but in terms of his cooperation, he deserves much credit,” said FBI Special Agent in Charge Michael Ward. “His efforts exposed corruption at unprecedented levels.” Dwek helped convict numerous individuals, including Hoboken Mayor Peter Cammarano, Secaucus Mayor Dennis Elwell, Jersey City Council President Mariano Vega Jr. and Jersey City Deputy Mayor Leona Beldini. Stanley “Muscles” Davis, the half-brother of Trenton Mayor Tony Mack, was sentenced to six years in prison for a scheme to have city employees work private jobs while they were on the city payroll. Davis, a former supervisor at Trenton’s water utility, pleaded guilty to official misconduct. Prosecutors said he was the mastermind behind a system that allowed utility workers to do private jobs while they were paid emergency overtime by the city. The Davis case is unrelated to the indictment of his half-brothers, Mayor Mack and Ralphiel Mack. The two, along with Joseph “JoJo” Giogianni, were indicted on charges of extortion, bribery and mail and wire fraud in connection with a scheme to trade $119,000 in bribes for Mayor Mack’s help in the development of a Trenton parking garage. Jay Alpert, a former Bergen County sheriff and former mayor of Randolph, was fired from his $110,000 job at the Port Authority of New York and New Jersey. The authority said he misrepresented his academic credentials. Alpert, the authority’s manager of emergency readiness, listed bachelor and master’s degrees in criminal justice from LaSalle University. The authority said it discovered his degrees were not from the Philadelphia university, but from a defunct diploma mill whose founder was jailed on fraud and tax charges. A former engineer with the New Jersey Department of Transportation, Kenneth Huber, pleaded guilty to taking a $24,000 bribe from a contractor. Huber wanted the money to buy a tractor, according to the feds. Huber, the resident engineer for a federally funded construction project on Routes 1 and 9 in Bergen and Hudson counties, agreed to accept bribes in exchange for his assistance with $300,000 worth of change orders. A federal judge sentenced former Toms River school superintendent Michael Ritacco to 11 years and three months in prison for taking between $1 million and $2 million in bribes. Federal Judge Joel Pisano called the Ritacco case the worst case of public corruption he has seen. Pisano ordered Ritacco, 66, immediately taken into custody. Ritacco pleaded guilty in April to charges of mail fraud and conspiracy to defraud the IRS. “By accepting bribes of more than a million dollars and cheating on his taxes, he betrayed the trust of the taxpayers, students, parents and teachers of that school district,” said U.S. Attorney Paul Fishman. Between 2002 and 2010, Ritacco accepted the bribes in exchange for arranging and maintaining a certain company’s insurance business with the school district. Ritacco and others involved in the scheme used middlemen, shell companies, sham consulting contracts and third-party payments to hide the bribes, according to the feds. New Jersey’s culture of corruption made national headlines again with the arrest of Trenton Mayor Tony Mack. Mack was arrested along with his brother, Ralphiel Mack (Trenton High School football coach), and associate Joseph “JoJo” Giorgianni and charged in a scheme to extort bribes of more than $100,000 in connection with the development of a public parking garage. The feds charged Mack and the others with negotiating bribes with two people and agreeing to expedite approvals for the garage and sell city-owned land at a fraction of its value. The two people Mack was negotiating with were cooperating with the FBI. The feds, who used court-ordered wiretaps to gather evidence, said code words were used by the defendants to avoid detection. Giorgianni, a convicted felon and proprietor of a Trenton sandwich shop called JoJo’s Steakhouse, was caught on tape agreeing to be an intermediary for cash payments to the mayor, according to the feds. Giorgianni said he conducted business in Trenton the way Boss Tweed ran Tammany Hall and gave examples of the way kickbacks should be exchanged for city contracts, according to the criminal complaint. The code word for receiving cash was “Uncle Remus.” The feds cited several conversations in which Giorgianni contacted the mayor and used the code word after receiving or expecting cash. The feds also charged Giorgianni and eight others with distribution of oxycodone. The mayor and his brother were not charged with the narcotics conspiracy. A judge told former Newark Mayor and one-time powerful state Sen. Sharpe James that he broke the law when he used $94,004 in campaign funds for his legal defense. Superior Court Judge Harriet Klein ordered James to replay the $94,004 he spent on legal fees and to pay a $30,000 fine. The ruling was the result of a lawsuit filed by the Election Law Enforcement Commission. “Candidates who disregard the law must face the consequences,” said Jeffrey Brindle, ELEC’s executive director. A jury convicted James of illegally steering city land to his girlfriend, who sold the land for a profit. After serving 18 months in jail, James returned to Newark where he was greeted with cheers. James said he would appeal Klein’s ruling because much of the spending was before he was indicted. Six months after closing arguments, federal Judge Freda Wolfson acquitted Wayne Bryant of all charges in his second corruption trial. Bryant requested a trial without a jury, leaving Wolfson to make the decision. Wolfson presided over the first Bryant trial where a jury convicted him of bribery. After that conviction, Bryant, who faced the possibility of 10 years in jail, was given a four-year sentence by Wolfson. During the six months between closing arguments in the second trial and Wolfson’s acquittal, Bryant was able to serve his time at the Monmouth County Correctional Facility. He was initially housed at a federal prison in West Virginia. Wolfson said she found evidence presented in the second trial by federal prosecutors lacking. Prosecutors said Bryant was paid nearly $200,000 in secret legal fees for official votes and other actions that resulted in millions of dollars in state loans and benefits for an EnCap golf project and redevelopment projects in Camden and Pensauken. Prosecutors called the fees, for which Bryant did no work, bribes for supporting projects for the North Carolina firm Cherokee. Witnesses testified that Bryant never disclosed the payments during public meetings on the projects. Wolfson said she found it possible that Bryant had not performed any legal services for the retainer because the projects were not far enough along to need his services. She wrote: “On its face, there is nothing illegal about a monthly retainer agreement. It is not surprising that state legislators…are hired or retained by municipalities or developers…perhaps in part for their political acumen.” Had the second trial been a jury trial, the outcome might have been different. State Comptroller Matthew Boxer hit another home run by uncovering big bonuses for top executives at the Middlesex County Improvement Authority. Boxer’s audit found the authority paid its top four officials more than $100,000 in bonuses, including a $55,617 bonus to its executive director. In 2010, executive director Richard Pucci received $249,366 from the authority, including a salary of $185,384, the $55,617 bonus, a $4,800 car allowance and $3,565 in unused sick time. Pucci did not receive any written performance evaluations. Authority officials said that was because the evaluations were verbal. Boxer also said the way the authority was handing out contracts violated state law. A review of nine professional service contracts found the authority did not use appropriate vendor-selection criteria for eight of the contracts. Instead of cost information, the authority required vendors to have “knowledge of the authority and its operations.” All nine of the contracts were awarded to companies that previously held contracts with the authority, which received more than $8 million in county government money in 2010. Pucci, also the mayor of Monroe Township, said the authority “cherry-picked” items to criticize. The Port Authority of New York and New Jersey’s inspector general investigated the sick days of Port Authority police officer Thomas Jardines and found him responding to fires and washing a fire truck on days he called in sick, according to the Star-Ledger. Jardines is chief of the volunteer Jefferson Township Fire Company No. 2. The Star-Ledger reported that Jardines was suspended for 45 days after he was caught on videotape doing the firefighter work on days he called in sick. He will lose an estimated $11,000 in salary, according to the Star-Ledger. The New Jersey Supreme Court, in a 3-2 decision, ruled that unlike other New Jersey state workers, judges do not have to pay more for their pension and health benefits. The state constitution does not allow other branches of government to reduce judges’ salaries. (The goal of the provision is to make sure a judge’s salary cannot be cut for an unpopular ruling.) The high court ruled that benefit payments affect a judge’s take-home pay, and therefore the judges’ contributions to benefits cannot be increased. The state argued that benefits should not be considered salary. The legislature, which passed a law last year increasing benefit contributions from state workers, quickly moved to pass a ballot measure that will give New Jersey voters the chance to vote on a constitutional amendment that would allow judges to pay more for benefits. Taxpayers footing the bill will have the final say. A part-time employee of West New York called in sick 33 times in 2010 and 2011 and worked most of those days in five other New Jersey towns where he was a part-time employee. Documents, including timesheets and payroll records obtained through requests under the New Jersey Open Public Records Act, revealed that Frank Recanati , a plumbing sub-code official and inspector at his main job, called in sick in order to work the five other jobs. Recanati is a member of the Communications Workers of America whose handbook prohibits employees from working elsewhere after calling in sick. In addition to working as a part-time sub-code official in the six towns, Recanati was a construction official in a seventh town. “Only in New Jersey. I mean who has seven jobs?” said Jerry Cantrell, president of NJ Taxpayers Alliance. “This is a clear abuse of the public trust.” In 2011, Recanati earned $131,455 from the six municipalities. State Comptroller Matthew Boxer found that local governments are keeping their attorneys, and other professionals working as independent contractors, in the state pension system, despite a state law prohibiting the practice. A 2007 law made it clear that independent contractors were to receive no more pension credits after 2008 or when their contracts expired. Instead, towns have not booted them out of the pension system. Boxer referred 202 such contractors to the state division of pensions for review and removal of improper pension credits. The cost is potentially millions of dollars each year, Boxer said. “We decided to investigate just how widespread the problem of improper participation in the state pension system is, and what we learned it that the problem is extensive,” Boxer said. Comptroller Matthew Boxer, July 17, 2012; Asbury Park Press, July 18, 2012. The “kidney salesman” arrested in a July 2009 federal sweep that netted 44, including New Jersey politicos and rabbis, pleaded guilty and was sentenced by a federal judge to 30 months in jail. An Israeli citizen living in Brooklyn, Levy Izhak Rosenbaum, 61, pleaded guilty to three counts of illegally selling kidneys for cash. He admitted being paid $120,000, $150,000 and $160,000 for the organs. Rosenbaum was caught by the FBI after Solomon Dwek, who cooperated with the feds, and an undercover FBI agent pretended to need a kidney for an uncle. Rosenbaum admitted that he located individuals in Israel willing to be paid for giving their kidneys to New Jersey residents. The former mayor of Toms River Township (formerly Dover Township) was arrested upon his return from Afghanistan and charged with tax evasion. The feds charge that Carmine Inteso accepted hundreds of thousands of dollars from a Maryland insurance broker whose companies provided brokerage services to municipalities and school districts, including Toms River Township. The payments were made to a company controlled by Inteso who used the money for his personal expenses, the feds charged. Despite receiving the $291,000 between 2006 and 2008, the feds charged that Inteso filed no personal income taxes for those years. Agents for the FBI and IRS greeted him at the JFK Airport in New York after he returned home from work in Afghanistan as a contractor. Former Hamilton Township director Robert Warney pleaded guilty in federal court to money laundering. Warney admitted he was an intermediary for a $5,000 check from an insurance broker to Hamilton Mayor John Bencivengo. Warney said he funneled the money in cash to the mayor in small amounts over a period of several weeks. Bencivengo has been indicted and charged with accepting $12,400 in bribes to help an insurance broker renew a contract with the township school board. The mayor, maintaining his innocence and staying on the job, entered a plea of not guilty. On his 2011 financial disclosure form, Bencivengo listed the money from the insurance broker as a loan. His lawyer said the broker was a friend, not an accomplice. As is often the case with the feds, the evidence presented at the trial will be secretly recorded conversations. The jury members will have the chance to hear exactly what Bencivengo and the broker said to each other. They will decide whether the money was a loan or a bribe. In June, New Jersey corruption attracted the attention of the New York Post, which pointed out that over the past seven years, 16 New Jersey mayors have been arrested by the feds. Ed Stier, former director of New Jersey’s Division of Criminal Justice, told the Post that the state’s culture of corruption is alive and well. The Post wrote its article before former Toms River Mayor Carmine Inteso was arrested. The newspaper cited the last arrest as that of West New York Mayor Felix Roque. Roque and his son have been charged with hacking into a Web site, which supported a recall of Roque, and taking it down. The two also are charged with hacking into computers to intimidate persons associated with the Web site. In a three-part series, the New York Times exposed serious abuses at the halfway house system in New Jersey. The articles detailed widespread violence, gang activity, drug use and escapes. They showed a system that was set up for low-level offenders instead being used for violent criminals who were monitored by low-paid personnel. The dominant halfway house operator, Community Education Centers, has had longtime political connections to politicians of both political parties. Bill Palatucci, Gov. Christie’s close friend, is a senior vice president at the company. Christie, when a lawyer in private practice, was a registered lobbyist for the company in 2000 and 2001. The governor has visited and praised the company’s facilities. Democrats jumped on the chance to put more monitoring of the facilities into this year’s budget bill. Christie, who refused to be interviewed for the stories, watered it down. Here is a chilling New York Times description of the Trenton-based Albert M. “Bo” Robinson Assessment and Treatment Center, run by Community Education Centers: “Inmates are housed in barracks-style rooms, not cells. At night, one or two low-wage workers typically oversee each unit of 170 inmates. Out numbered and fearful, these workers sometimes refuse to patrol the corridors. Robbery, sexual assault, menacing of the weak --- in the darkness, the inmates’ rooms turn into a free-for-all. Inmates regularly ask to be returned to prison, where they feel safer, workers said.” Delaney Hall in Newark, also run by Community Education Centers, has been increasingly housing inmates charged with violent crimes, the articles said. The New York Times tells of a man housed in the facility for unpaid traffic tickets who is robbed of $3 and murdered. Essex County is freeing up beds at its jail next door by moving inmates into the halfway house. The empty county cells are then being rented to the federal government for federal inmates and immigration detainees. The county gets $108 a day from the feds for a jail cell and spends $73 per day of the county’s money for a bed at Delaney Hall. Essex County executive Joe DiVincenzo, who also would not be interviewed for the series, has touted federal correctional contracts as a way of keeping county taxes low. The New York Times was not the first to find fault with the halfway house system. Matthew Boxer, state comptroller, reported last year that there were “crucial weaknesses in state oversight.” The comptroller’s report cited escapes, shoddy buildings, large overpayments ($600,000) to those running the facilities and lax inspections. Boxer questioned the legality of the payment arrangement for Community Education Centers. The state can only contract with nonprofits for halfway houses. Payments are actually made to the nonprofit Education and Health Centers of America, which Boxer said is a shell corporation for the for-profit CEC. The company said the arrangement was cleared with the Attorney General’s Office in 1994 and 1996 (when Christie Whitman was governor). Boxer said it needs another review. As early as June 2010, Andrea Clurfeld of the Asbury Park Press outlined the Palatucci connection to the companies, his ties to Christie and the payment arrangement. Coauthor Bob Ingle’s new book (Chris Christie The Inside Story of His Rise to Power, written with Michael Symons) tells how former Gov. Tom Kean, as a young politician, visited Christie’s school and inspired Christie to politics. Now might be the time to take a look at one of the reasons Kean was so successful. He knew what to do with an investigative story when it exposed wrongdoing inside his administration. He wasn’t defensive. He was, in fact, as outraged as the reporter who uncovered those wrongs. He reacted quickly, leading the charge to cure the problem. Gov. Chris Christie could help himself and the state by doing the same when it comes to the New York Times stories on the halfway houses. Christie has a built-in conflict of interest. While the Democrats’ suggestion for more stringent monitoring could be viewed as clearly political, it needs to be done. New Jersey governors have the powerful ability to make major mistakes and major reforms. As a U.S. attorney, Chris Christie was a master at cleaning up wrongdoing. He needs to take a hard look at what’s happening inside New Jersey’s halfway houses and not only end the abuses but make what’s going on there more transparent. Like a Tom Kean, Christie needs to do it now. The New York Times and the New Jersey media, which have a long history of investigative reporting, should not let him off the hook on this one. Two state motor vehicle clerks and a conspirator, in a scheme that sold illegal driver’s licenses to customers who did not have the proper identification, have been sentenced to four years in jail. Former clerk at the North Bergen Motor Vehicle Agency, Cristian Toledo, pleaded guilty to computer theft. Former clerk at the Lodi agency, Anne Marie Manfredonia, pleaded guilty to conspiracy and tampering with public records. Hildeberto Salinas, who acted as a broker in the scheme, pleaded guilty to bribery and conspiracy. The three were among 40 defendants named in indictments that outlined a conspiracy in which customers, who did not quality for a license, paid between $2,500 and $7,000 for a license or license renewal. In some cases, those acquiring the licenses did not qualify because they were in the United States illegally. The clerks and the brokers divided the illegal profit, according to state prosecutors. Toms River contractor Brian Petaccio has been sentenced to five years in state prison for stealing more than $1 million in parking revenues from Hoboken’s parking meters. Petaccio, who pleaded guilty to theft, admitted stealing the million dollars between 2005 and 2008. 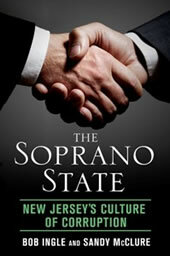 (You can find Petaccio in Chapter 9 of The Soprano State.) Also sentenced in the case was former director of the Hoboken Parking Utility, John Corea, who was sentenced to seven years in jail. Corea pleaded guilty to official misconduct, admitting that he knew that Petaccio had stolen parking revenues and did nothing about it. Corea also admitted steering no-bid parking revenue collection contracts to Petaccio and lying to city council about the qualifications of Petaccio’s company. Hamilton Mayor John Bencivengo has been charged by the feds with attempted extortion. The FBI said the mayor sought and accepted a $12,400 bribe to make sure a school district insurance brokerage contract was renewed. Bencivengo has allegedly been caught on tape agreeing to speak to a member of the school board about voting to renew the contract in exchange for money to pay his taxes and living expenses. The problem for Bencivengo, as it has been for others, is that the person he was dealing with was cooperating with the feds. Bencivengo has refused to resign and said he is innocent of the charges. Months before the Bencivengo arrest, the Hamilton branch of The Citizens Campaign, a reform group, urged the school board to reform the way it awarded health insurance contracts. The request was prompted by information the group gathered from an Open Public Records Act request. Groups like The Citizens Campaign need more support and more clout if there is any hope for government reform in New Jersey. After much delay, former Jersey City Deputy Mayor Leona Beldini reported to federal prison on April 15, 2012. Convicted of bribery in February 2010, she was sentenced to three years in prison on June 2010. Motions based on health issues delayed her surrender. Federal Judge Jose Linares, however, ruled that whatever health care Beldini, a former burlesque queen, needs, she can get in jail. She is at the Federal Medical Center Carswell in Fort Worth, Texas. The facility specializes in medical care for female prisoners. Former Secaucus Mayor Dennis Elwell has been sentenced to 2 years and 6 months in prison for accepting a $10,000 bribe. After a two-week trial in July 2011, a jury found Elwell guilty of accepting $10,000 in exchange for using his office to help a developer secure approvals in Secaucus. Elwell accepted the cash through an intermediary. Solomon Dwek, the purported developer, was cooperating with the feds. Elwell was among 44 arrested in a federal corruption sweep in July 2009. Former Toms River schools Superintendent Michael Ritacco pleaded guilty to taking between $1 million and $2 million in bribes in return for funneling insurance business to the district’s former insurance broker, Francis Gartland, who also pleaded guilty to a bribery scheme that was large even by New Jersey standards. Gartland’s plea came first, followed three days later by Ritacco’s. The two pleaded guilty to charges of mail fraud and conspiracy to defraud the IRS. Gartland also admitted perjury. U.S. Attorney Paul Fishman said Ritacco’s conduct “strikes at the core of our trust in government and is intolerable.” Ritacco, Gartland and two others used middlemen, shell companies, sham consulting contracts and third-party payments to hide the bribes, Fishman said. Ritacco agreed to forfeit $1 million, a Mercedes and more than $8,000 found in his oceanfront home. The Delaware River Port Authority wasted not thousands, not hundreds of thousands, but millions of tollpayer dollars, New Jersey Comptroller Matthew Boxer reported. “In nearly every area we looked at, we found people who treated the DRPA like a personal ATM, from DRPA commissioners to private vendors to community organizations,” Boxer said. The Boxer investigation revealed that $1.5 million in commissions related to the placement of DRPA insurance policies was shared among disclosed and undisclosed insurance brokers under less than transparent dealings. The commissions were shared whether or not the brokers performed any corresponding services for the DRPA, Boxer said. South Jersey political boss George Norcross’ insurance agency was paid $410,000 of the fees. In addition, the vast majority of a fund that donated money to social and civic causes went to organizations linked to DRPA officials or to organizations that provided a benefit to officials in exchange for the contribution. The DRPA also ignored its own policies in the funding of $400 million in economic development projects, with the projects being championed by the agency’s commissioners or a state official. Handing out lifetime free E-ZPass transponders to retired commissioners, employees and others cost tollpayers $1 million. And DRPA employees were wrongfully reimbursed for expenses, including two employees who were reimbursed $2,000 for attending the Pennsylvania Society Weekend at the Waldorf-Astoria hotel in New York City. In 2011, NJ Transit spent $4.1 million on payouts for unused sick and vacation time. Starting this year, payouts for sick leave were eliminated for new hires. But despite a modest scaling back on the practice, NJ Transit’s bill for the sick and vacation time payouts grew $3.67 million compared with 2010. Salary records obtained by the Asbury Park Press showed 736 employees cashed in $2.6 million in unused vacation time. The 10 workers with the highest vacation payouts were handed checks of $20,383 to $28,615. Employees cashed in $1.5 million in unused sick time. Twenty employees received the $15,000 limit for retirees for unused sick time. Former Guttenberg councilman and police officer Vincent Tabbachino has been sentenced to 41 months in prison for attempted extortion and bribery and money laundering. A jury convicted Tabbachino of offering and agreeing to give a corruption payment to Ridgefield Mayor Anthony Suarez, who was acquitted at trial. Tabbachino pleaded guilty to laundering money for Solomon Dwek, who cooperated with the feds in a wide-ranging corruption sting. A federal judge dismissed the bribery charges against former state assemblyman Lou Manzo of Jersey City. U.S. District Court Judge Jose Linares ruled that the bribery statute does not apply to candidates. Manzo had recently lost an election for mayor of Jersey City when he was arrested and charged with taking more than $20,000 in bribes from a federal informant posing as a developer seeking favors for his projects if Manzo was elected mayor. Lydell Sherrer, who was both an assistant commissioner and deputy commissioner at the Department of Corrections, pleaded guilty to extortion or trading jobs and promotions for bribes. Sheerer plead guilty to extorting money from a corrections employee who was about to get laid off. Sheerer agreed to find the employee a job with corrections or with a corrections subcontractor in exchange for $10,000. As part of the plea agreement, Sheerer admitted taking $69,000 in bribes from eight individuals. “Mr. Sherrer not only abused his public trust, he tried to enrich himself by taking advantage of subordinates who wanted only to keep their jobs,” said U.S. Attorney Paul Fishman. Federal Judge Jose Linares ruled that former Jersey City deputy mayor Leona Beldini, 76, who was convicted of bribery, must serve her three-year sentence. Linares checked with the prison system and determined that whatever health care Beldini, a former burlesque queen, needs, she can get in the slammer. The jury that convicted Beldini sat through a two-week trial and spent two days deliberating before convicting her. She appealed her conviction, and an appellate court said the appeal had no merit. Linares ruled the delay is nearly over for the woman who used to be known as Hope Diamond, Gem of the Exotics. He gave her until April 3 to get whatever healthcare she made need in the outside world. Beldini was rounded up and arrested with 43 others in the summer of 2009 in the wake of a corruption investigation by the feds. She was convicted of taking $20,000 in illegal campaign contributions in exchange for a promise to use her official influence to help the real estate development projects of a man who in reality was an undercover operative for the feds. The feds presented both video recordings of Beldini and the testimony of the operative, Solomon Dwek, at the trial.